Will Jurassic World 3 take Rexy into the far reaches of the galaxy? As crazy of an idea as it may seem, it's quite possible that future installments in the Jurassic Park / Jurassic World franchise may feature our beloved dinos wreaking havoc outside of Earth's atmosphere. This was an out of this world idea that Jurassic World: Fallen Kingdom director JA Bayona says may be a possibility in the future. This idea seemingly originated at ComicBook.com, who brought it to the attention of JA Bayona and Bryce Dallas Howard, who both had some different opinions on the matter. While it could certainly be fun, Bayona didn't necessarily see it being in the immediate future of the franchise. Here is what the Fallen Kingdom director had to say on the matter. "Maybe, I don't know. I think, somehow, what is interesting about the Jurassic franchise is that they reflect on the moment that we live in. This is something that comes from very early on in the original book from Michael Creighton. So, I don't know, if we start to talk about going back to space, maybe there's a possibility that in the future we will talk about that in the Jurassic movies." Bayona certainly raised a good point. As cool as space dinosaurs would be, they don't really help the current narrative or fit with the present day setting of the franchise. Right now, the Jurassic movies want to focus on their current plot: dinosaurs have been released on the rest of the world (or at least North America), and all of human civilization will now have to adapt to the return of these prehistoric beings. However, the Jurassic franchise has been going strong for 25 years now. Perhaps, if space travel becomes more common in future decades, and if the franchise is still alive, the setting of that future time period will allow for the "final frontier" to enter the Jurassic movies. With the first private passenger space trip being announced earlier this week, this possibility may not be too far fetched. Jurassic World actress Bryce Dallas Howard seemed a lot more onboard with the idea of featuring space in Jurassic World movies. Though she noticeably thought the idea was a little out there, laughing as soon as she heard the pitch, she still seemed to love the concept. Here is what Howard had to say in response to the idea. "Oh my goodness, dinosaurs in space. What if? 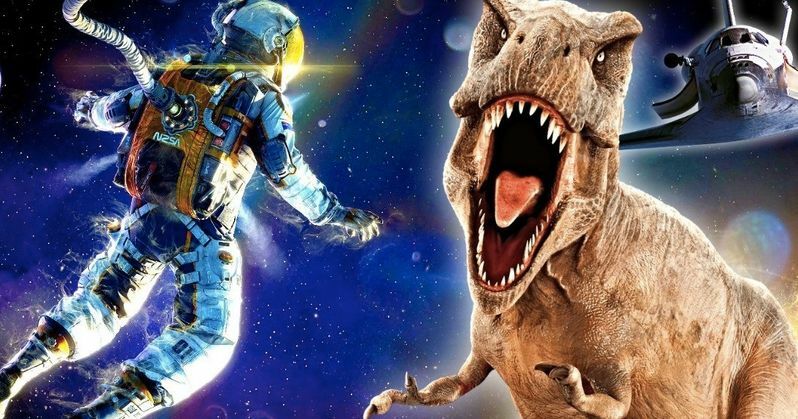 What if dinosaurs were in space? I guess we're gonna find out in Jurassic World 27! That would be jumping the shark, for sure." Though this idea from ComicBook.com may seem a little crazy, there's no denying that it has the potential to be a box office hit. Audiences love dinosaurs, and they love space thrillers. Put those two together with a blockbuster budget, and it could end up being Avatar. Of course this is all hypothetical, as there's no guarantee that a movie like this could ever happen, but the fact that it is a "possibility" is honestly enough to get us excited.